If you like classic slots then Jackpot 6000 is going to really get your reels spinning. The top payout is 6,000 coins and to help you win big payouts there’s a mystery win feature which could pop up at any time and a gamble feature to spin up your winnings whenever you want! Are you looking for a classic style 3 reel slot machine that could land you a jackpot of 6000 coins? If yes, then Jackpot 6000 might just be the perfect slot for you. The slot has a major jackpot of 6,000, a mystery win feature and a gambling feature that allows players to test their luck and get a chance to double their winnings. The jackpots are not that high when compared to modern day slots, especially progressives, but they are acceptable considering the fact that the gambling feature can double up the amount that you win every time you make a winning combo. Are you ready to spin the reels and test your luck? Maybe you could be the one who gets to lay their hands on the jackpot. Spin the reels and see for yourself! 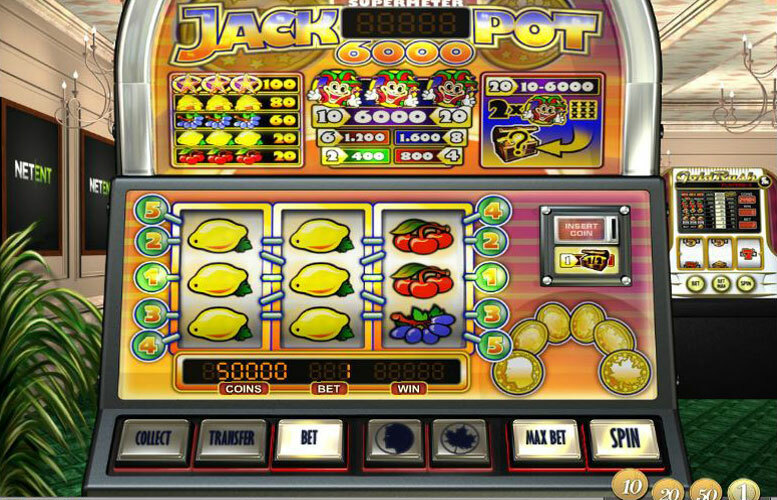 The Jackpot 6000 slot offers two major jackpots. The top jackpot is worth 6,000 coins and the second highest jackpot is worth 1,600 coins. To win the top prize on the paytable you must be playing all 5 reels at a bet level of 10. If you turn down the bet level then the top jackpot is also reduced. When you click the ‘Bet’ button you can see the top prize available lit up in the middle upper panel of the game screen. If the player lands with 3 Jokers while they are betting on 10 coins, then they would win the top jackpot worth 6,000 coins. If the player hits the winning combination of 3 Jokers while playing with 8 coins, he would be entitled to the second highest jackpot worth 1600 coins. The amount continues to reduce as you reduce the bet level and goes right down to a 400 jackpot at bet level 1. The gamble feature does allow player to multiply any winnings and double them if they want but this is suspended at the 3,000 coin level. Alternatively, players can just collect their winnings and choose not to gamble them up. When the player wins on any active pay line, the gamble feature is automatically triggered into action. The player can choose to simply collect their winnings or gamble the entire amount. The option to gamble part of their winnings, while keeping the other part safe in case they lose, is also available. The gamble feature adds an additional thrill to the game and provides a chance to boost winnings but remember 3,000 is the max you can win with this feature. It is basically a Heads or Tails bonus game in which you choose either Heads or Tail and if you’re correct your winnings double and you can go again if you want or if you’re incorrect you lose the whole lot. If you are betting 10 coins and 2 Jokers appear on the reels, you qualify for the Super Meter Jackpot feature. The feature entitles you to a mystery bonus prize that could be from 10 to 6000 coins. You can then choose to gamble this prizes or collect it. Jackpot 6000 allows players to place to select their amount per spin based on 10 different bet levels. Coin value is fixed at 0.10 and you can choose from 1-10 in bet levels which moves the amount bet per spin from 0.10 right up to 1. Joker: If three Jokers appear on any of the active pay lines, while the player has wagered 2 coins, they would be entitled to a reward of 400 coins. If the player has placed the bet on 4 coins, they would get a reward of 800 coins. Wagering 6 coins would entitle the slot player to a reward of 1200 coins. If the player places a bet on 8 coins, they would win 1600 coins. Placing a bet of 10 coins would entitle the player to win 6000 coins. Star: If the player gets 3 Stars on the reels, they are entitled to win 100 coins. Bell: If 3 Bells appear on any of the active pay lines, it means that the player has won 80 coins. Grapes: Appearance of 3 Grape Symbols rewards the player with 60 coins. Lemon: If the slot machine displays 3 Lemons, it indicates a reward of 20 coins for the player. Cherries: 3 Cherries on any of the active pay lines entitle the player to a payout of 20 coins. This game has a rating of 2 / 5 with 714 total reviews by the users.